The success of parents can only be seen through their children. All countries have their own social problems. In the Philippines, mental illness and drug abuse can be traced back to the changes in parenting styles of Filipinos. Since the overseas Filipino workers become in demand, many children end up in despair. There’s one thing that cannot be denied though. Numerous successful individuals are mostly raised by the single mothers. This is why Gov. Imee Marcos, a candidate for Senator serves as a role model as commended by her own children. 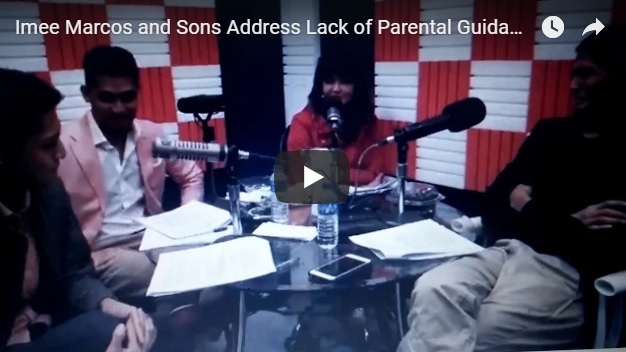 [VIDEO]: In Imee Sagot radio program the 3 sons of the Bet for Senator express their views on lack of parental guidance as a social problem. Atty. Michael Manotoc said that in today’s world, hackers made a name for themselves. Borgy Manotoc added that the youngsters can be superstars in their own games online. Board Member Matthew Manotoc also confirmed that there’s already some sort of digital gaming career. However, the motherly instinct of Gov. Marcos brings the topic back to the symptoms of mental illness among youngsters. The governor urges the audience to be vigilant with the mental illness symptoms that manifest among children and teenagers. They include violence, anti-social or overly exaggerated or repetitive behaviors. She said that it is best to treat them as another condition like depression. Psychiatric help is a must. In the digital age, many people not just the young ones find their own world online. They can’t see any need for socialization because they are already comfortable with their digital lifestyle. However, once they are influenced badly by their cyber contacts, they can be prone to drug abuses or even criminal acts. Some are even used by their own parents for drug trade because the underaged kids are spared by the law. Nonetheless, Atty. Manotoc said that to drug test schoolchildren is an overkill. The dashing model then recommended that the parents must be held accountable for their offsprings’ misdemeanor or a big mess. Regardless of what age and lifestyle we are in now, some things just never changed. Balancing the mind with the body is still crucial. Nothing is wrong with enhancing the mind and sight coordination using computerized gadgets for as long as physical activities can also go along with it perhaps in another set of activities with family or friends.